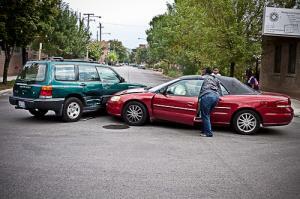 Seattle T-Bone Collision Lawyer | Davis Law Group, P.S. T-bone car accidents – also commonly called side-impact collisions – are responsible for more than 25 percent of all vehicular fatalities, according to data from the Insurance Institute for Highway Safety (IIHS). Those who are fortunate to walk away from a side-impact crash are often times seriously injured, which leads to costly medical bills and lost wages due to missed time at work. What is an accident victim to do in a situation like this? If you're badly injured in a crash due to someone else's negligence, it may be in your best interests to contact an attorney to learn more about your legal rights. Davis Law Group has nearly 25 years of experience helping t-bone accident victims throughout Washington state get the best possible result for their personal injury claims. A T-bone collision occurs when one vehicle collides with another from the side, resulting in the two (or more) vehicles forming the shape of a “T." These incidents are often caused by one vehicle failing to stop at a stop sign or red light and striking the side of another vehicle which is traveling in a perpendicular direction. Of course, there are likely a number of other plausible explanations for a T-bone crash. In our experience with a variety of motor vehicle accident cases, failure to yield or running a red light is the most common reason for side-impact accidents. Back & Neck Injuries: The sudden impact of an unexpected collision can result in a wide-range of back and neck injuries, from whiplash to a broken neck. Bulging Discs: Discs and vertebrae in the neck and back can become disfigured or damaged in the event of a T-bone crash. Head Injuries: An unsuspecting driver will typically not have the time or awareness to brace for a side-impact crash, which can result in physical trauma to the head from steering wheels and dashboards. Broken Bones: Fractures and broken bones are common in collisions where an occupant was struck directly by another vehicle, or when the collision causes major damage to the vehicle. Wrongful Death: In very serious instances, any of the above scenarios or injuries can lead to death. The traveling speed of the vehicles involved in a T-bone crash, as well as the exact point of impact, can have a major impact on the severity and extent of a person’s injuries. In the event that a T-bone collision occurs due to a power outage or broken traffic signal, determining liability for the accident can be complex. A thorough investigation must be conducted to determine all possible contributing factors and collect evidence that might support a person’s claim. Our award-winning personal injury attorneys have more than 20 years of experience investigating complex and serious-injury car accidents. We will follow every possible avenue of our investigation to support our clients’ case as well as help increase the value and chances of a successful resolution to the case. The personal injury attorneys at Davis Law Group will review your T-bone collision case free of charge and help you better understand your legal rights and options. If we believe we can help, we’ll schedule you for a free legal consultation with our attorneys and explain exactly how hiring an attorney will benefit you. Call our office in Seattle at (206) 727-4000 or use the confidential contact form on this page to have your case reviewed by our legal team. Someone from our office will follow-up with you to discuss the facts of your case and explain the next steps in the process.